Home » authors » Swamplandia ! Before Disney took over Central Florida, before Harry Potter was even an idea in J.K. Rowling’s mind to become a Universal Studios attraction, I remember seeing billboards advertising alligator farms on the long stretch of flat Florida highway that never seemed to end. Karen Russell uses that attraction to create a moving story about a family trying to survive. After their mother, the alligator wrestler, dies suddenly of ovarian cancer, the Bigtree family and the “Number One Gator-Theme Park and Swamp Cafe” seem doomed, but the three teenagers who have been part of the ongoing alligator show and family business are determined to save the family, the alligators, and themselves as they struggle to grow up without their mother. Using the voice of young thirteen year old Ava, Russell begins this story with humor and pathos; she follows the children’s grief over losing their mother as they struggle to maintain a sense of normalcy in a family that is falling apart. Ava decides she will replace her mother’s act and become the youngest champion alligator wrestler in the world and save the show with a new attraction – a newly hatched red alligator. Ava’s older sister, Ossie, begins a study of the occult, trying to contact their mother through a Ouija board, and desperately imagines dates with dead watermen and trips to the Underworld to find their mother. Ava’s seventeen year old brother, Kiwi, secretly longs for a better life and leaves the swamp to take a menial low-paying job at their competitor, “World of Darkness,” the new water slide ride – hoping to save enough money to send back home. These three key characters are flanked by a grandfather, Grandpa Sawtooth who is sent to live under assisted care after he bites a customer; and a father, Chief, who leaves Ava and her sister alone in the swamp to go off to the mainland to make money. Swamplandia! sneaks up on you. One minute you are laughing at the ridiculous situations and funny incidents; then you are crying over the reality of their hard life and the raw reality of how much they miss their mother. 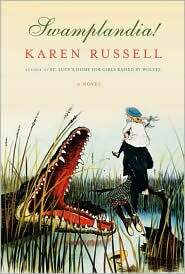 Russell uses the charm of a backwoods Tammy on the river to lull you into thinking this is another sweet story, but soon the sharp lessons of unbearable grief and survival, despite enormous disadvantages, unravel. The story uses its cast of strong characters to draw you into a wacky world where you will wonder at Russell’s imagination and ability to create craziness. If you stay with the ridiculous, you will be rewarded as the plot turns into drama, betrayal, and suspense. Ossie abandons Ava to elope with a strange character, who may only exist in her head. Ava, alone at their cabin, falls prey to a wandering degenerate who convinces her to come away with him, in search of Ossie. Kiwi becomes their saviour in an unexpected twist. The ending is a little contrived but no less powerful. 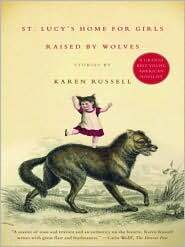 I’ve had Russell’s debut book, St. Lucy’s Home for Girls Raised by Wolves, a collection of short stories, on my shelf for a while – time to dust it off and get into it. I like this author. This entry was posted in authors, book review, books, places to go, reading, short stories and tagged alligator farms, Fiction, Florida, Harry Potter, Karen Russell, St. Lucy's Home for Girls Raised by Wolves: Stories, Swamplandia, Universal Studios Florida, World of Darkness. Bookmark the permalink.